I've been trying to decide if I want to make a gingerbread house this year, or just gingerbread people, with my son. I'm still not sure but I know I want to make something since I always forget how warm and comforting the flavor and smell of gingerbread is in a house. These would be an awesome gift in a little box or bag with a tin of cocoa or a bag of coffee. I would love it anyway. You could leave out the white chocolate if you wanted to, or add in dark chocolate (I almost did that) and it would really add to the flavor. You could also drizzle these with chocolate or some caramel just before serving. This is week 12 of the 12 Weeks of Christmas Treats Blog Hop. I'm really sad this is the last week because I've enjoyed seeing everyone's creations and discovered so many wonderful ideas. The hop is hosted by Brenda at Meal Planning Magic. She's kind enough to orchestrate the whole hop and let all of us be a part of it. If you would like more information on how to join the hop next year check out her site. 1. Preheat the oven to 350F. Mix the butter and sugar on medium speed until light and fluffy. Add in the eggs, molasses, and vanilla extract, mix until thoroughly combined. 2. Add the flour, baking powder, ginger, cinnamon, and salt. Mix until combined. Add white chocolate chips, stir until evenly mixed. 3. Spray a sheet pan with nonstick spray or place a Silpat on a sheet pan. Divide the dough in half and shape each half into 2 ½” x 9” rectangles on a sheet pan (Using wet hands may help, or lightly spray hands with nonstick spray). Bake about 25 minutes or until they are golden brown. 4. Remove from oven and cool about 10 minutes. Meanwhile, reduce the oven temperature to 325F. 5. When the biscotti rectangles are cool enough then cut them into 1” pieces and place the pieces back on the sheet pan. (I like to bake them on a cooling rack on the sheet pan so that air circulates around the pieces baking both sides, then I don’t have to worry about flipping them for even crispness). Bake another 8-9 minutes, or until they are toasted but not hard. Remove from oven and cool completely. Shannon, those sound perfect for the holidays!Love the caramel idea.I'll miss this blog hop too. 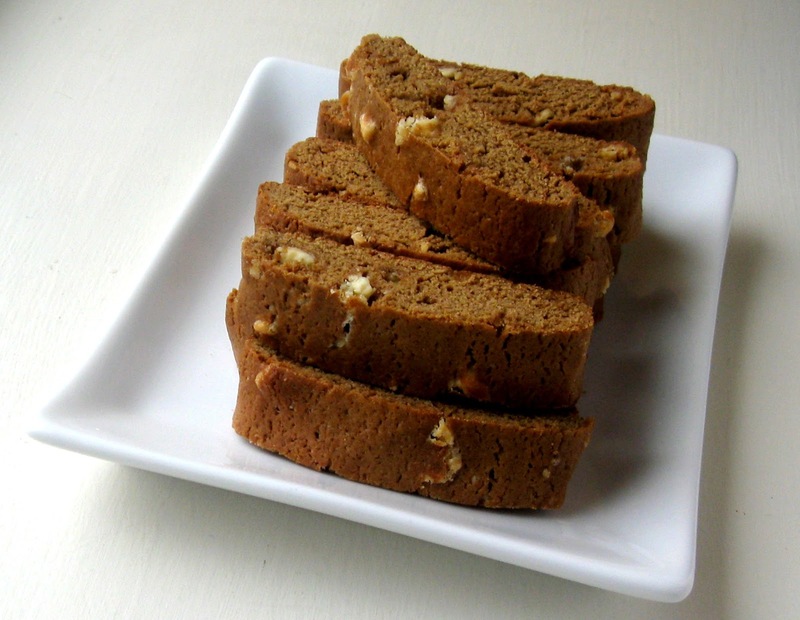 I think gingerbread may be my favorite flavor of biscotti. And I LOVE white chocolate and ginger. And I haven't made biscotti for a while and need to--now! The biscotti look perfect. Love the flavor combination. I would love the caramel but my husband would skip it. Thanks Annamaria :) My husband wouldn't go for the caramel either. 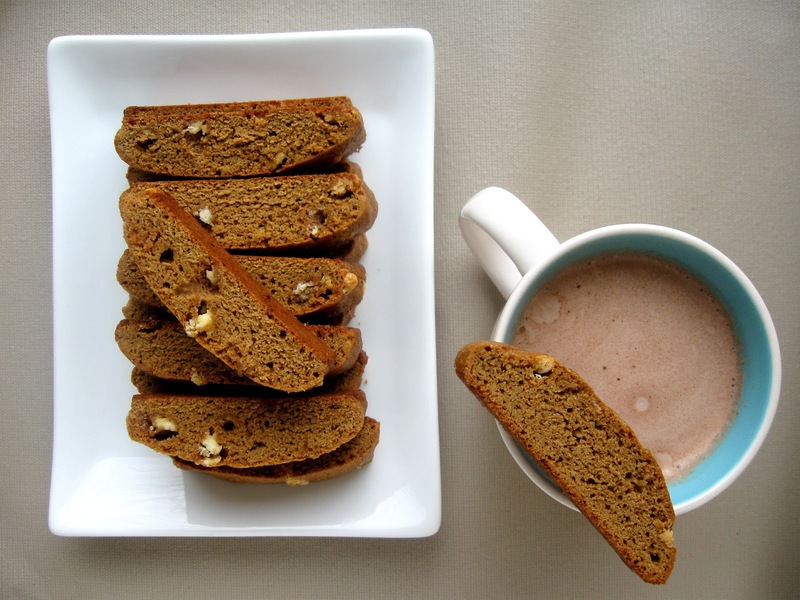 I love biscotti:) What an awesome idea, gingerbread and white chocolate!!! 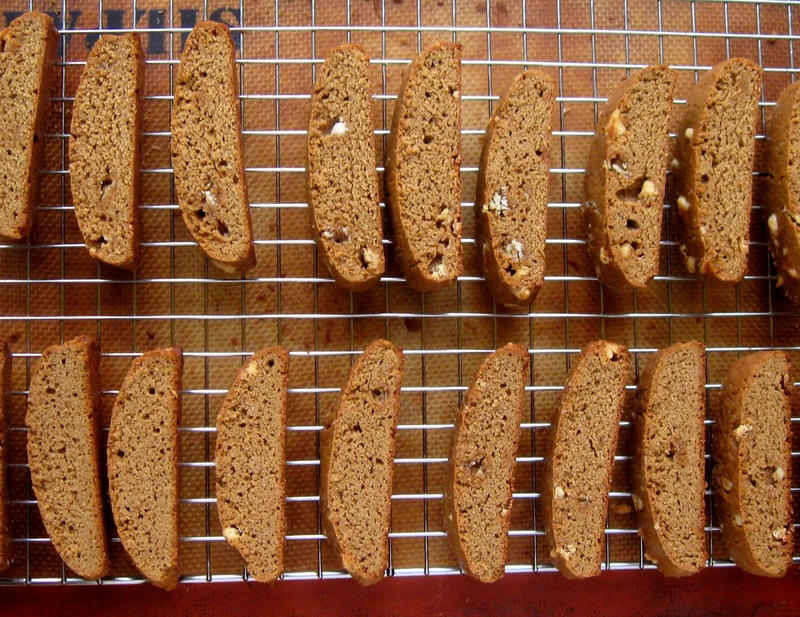 Just dropping in from Mandatory Mooch to check out this awesome biscotti.